Back in 2015, up to 20% of Norway’s population were either computer illiterate or worried about using the internet. This consisted mainly of older people. With Mobilhelpen anyone can now easily learn all they need to know about using smartphones, tablets, apps and a whole lot more. Via thorough user testing, our EGGS digital designers have helped Telenor apply universal design principles to create this accessible, visually expressive website. Over the past two years Telenor - Norway’s largest telecommunications company - has been carrying out its Internet for All program nationwide. Internet for All is a series of courses to help older people, or any others who struggle to use the internet, become more familiar with today’s technology. With over 850 courses having taken place, involving 13,000 participants, Internet for All has been a resounding success. Mobilhelpen is a free digital version of the course. It’s designed not only for those who attended a course and want to keep practising, but also for novices starting from scratch. Due to all Norwegian public services becoming digitalised, Mobilhelpen provides valuable help and support to anyone uncertain or worried about using the internet. To design a website for a specific user group, it was essential we found out exactly what their needs were. Thus, together with Telenor our EGGS digital designers engaged in a process of thorough user testing by applying service design methods. First, we set up a series of independent test labs at Netlife Research. Here we asked people to solve various tasks, whilst observing how they navigated their way through the site. We took note of what they struggled with, the mistakes they made, and where they became lost or stuck. We then established a booth at Oslo City shopping centre, where we stopped passers-by and asked them to try things out. To gain maximum insight into users experiences and needs, we carried out thorough tests. 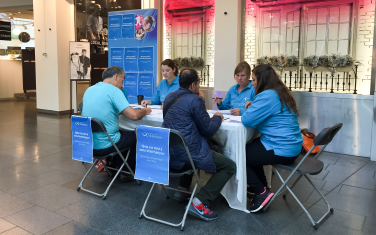 We set up a series of independent test labs, and established a booth at Oslo City shopping centre. By applying all these user insights, we designed a website that’s a piece of cake to navigate. With only eight main themes, the content is concise and provides simple step by step guidance to everything anyone needs to know about surfing the internet, alongside getting the most out of smart devices - from web browsing for beginners or getting started with apps, to becoming more familiar with social media, etc. Each theme also includes colourful visuals and bold headings, making all communication crystal clear. So, hopefully from now on older people will rest assured that they won’t cause a complete internet meltdown by pressing a wrong key! 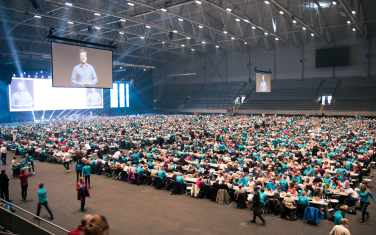 Mobilhelpen was launched at Telenor Arena, where 3000 participants were invited to take part in a beginner’s course. 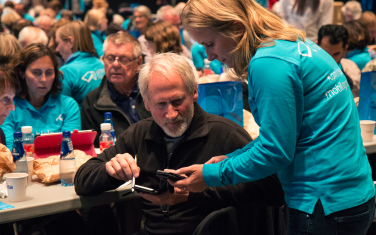 With 1500 Telenor employees on hand to assist, this also served as a testing of the whole site.